Coral bleaching has been heavily discussed in every climate-change blog, environmental journals and among the academia for the last few months. In fact, reports that the Great Barrier Reef is dead went viral on social media and caused mass uproar. People began posting updates lamenting the terrible things we have done to nature (which is a good thing. People need to be shocked into reality) and how “diving into the reefs” will never be ticked off of their bucket list. However, these reports were false. The coral reefs of the Great Barrier Reef, and other parts of the world are not dead. But, they are dying. Coral bleaching has been occurring with increasing frequency as a world phenomena for the last 20 years. The first mass bleaching was in 1998 (which destroyed 60% of the reefs in the Arabian Sea) and the second one was in 2008. Today, another, much bigger coral bleaching event is underway. This one is longer and therefore, much more dangerous than the previous bleaching events. What makes it worrying is that the corals of the world have not yet fully recovered from the 2008 bleaching event; the one that lasted for 2-3 years around the world. 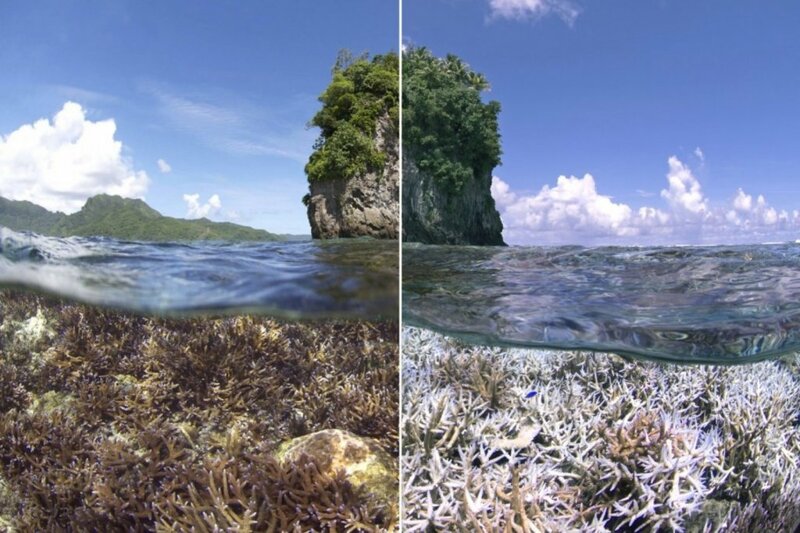 We are looking at a 40% permanent loss of coral reefs all over the world because of the current bleaching event. 40% of the coral destruction is being caused by these human activities, as opposed to only 10% caused by climate change. What is coral bleaching? Why does this happen? What are its implications? Lets answer these questions in this post. Coral bleaching-making corals a ghost. Quite literally. Corals are beautiful organisms with a variety of colors. What gives it these colors are the algae living within the coral structure. Corals have a symbiotic relationship with this algae (called zooxanthellae). The algae provides corals with food by performing photosynthesis and the corals provide a place for these algae to stay. The corals also provide it with carbon dioxide for the photosynthesis process, which they produce during respiration. This relationship takes place inside the coral structure. Algae are tiny, tiny organisms and are quite comfortable living within the cells of corals. While this is an efficient living arrangement, it also has a flip side to it. The algae are extremely sensitive to light, temperature, water composition and radiation. The slightest stress from these essential environmental factors causes the algae to malfunction. They cannot convert solar energy into chemical energy. Instead, this solar energy gets used up in production of peroxide. Peroxide is a highly toxic chemical that no living thing every wants within its body. But wait? Aren’t the algae within the corals? This peroxide gets accumulated within the coral bodies and slowly poisons the corals. This is when corals try to rectify the situation. Instead of choosing to die through slow poisoning, they expel the peroxide out of their bodies. But along with the peroxide, even the algae is expelled out. When algae leave the coral structure, it takes the color with it. This turns the corals white. It’s like a Dementor’s Kiss. The coral can continue to live for a while after the algae is expelled, but their soul is lost. Soon, this white, pale coral body gets a red, burnt look to it. That’s when you know for sure that the corals are dead. 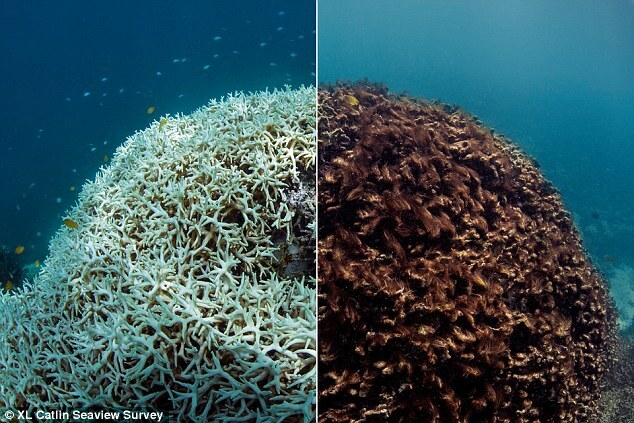 Bleached coral on the left, that dies after some time (on the right). Do corals have no mechanism to overcome bleaching? Of course they do! Once they are bleached, they do have the ability to recover the color. Algae that are left within the structure can reproduce asexually and bring the coral back to full health, as soon as the conditions become more suitable. In fact, even the dead corals can recover given time and the right conditions. The corals are yet to recover from past bleaching events. Even if the corals get back their colors, it doesn’t mean that they are fully healthy. They are extremely fragile, having recovered from a major environmental stress. 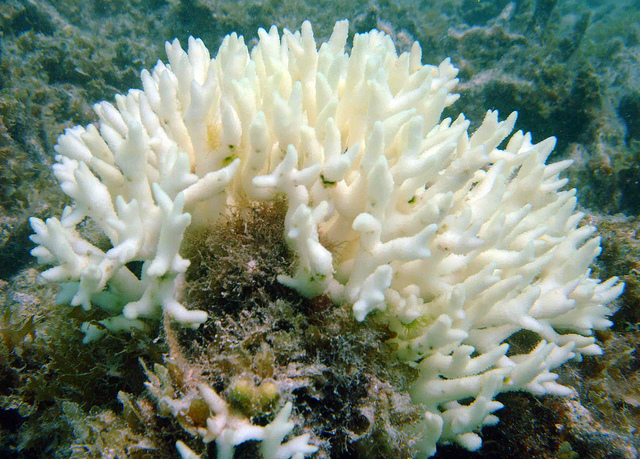 The large-scale bleaching events span many years. The current bleaching event started sometime in 2013. It is expected to continue till mid-2017. This is a very prolonged period of unfavorable conditions. Corals are not allowed to recover fully today because once they expel their algae, they are taken over by other species of algae that do not live symbiotically with them. This is harmful to the aquatic life that is supported by coral reefs. They also get eaten by coral-feeding organisms. Prolonged unfavorable conditions coupled with weak resistance after recovery leaves the corals susceptible to diseases and damage by coral eating organisms. Large scale coral bleaching + slow recovery time + prolonged unfavorable conditions = Imminent extinction. What is causing the unfavorable conditions? There are a few reasons to this. However, the corals are also increasingly being affected by the stupidity of human activities. How do you expect an already fragile organism to survive environmental stresses if you discharge sewage into their waters? Corals attract a lot of tourists from around the world. While most are there to observe their magnificence, some do not appreciate this and decide to pollute that area as well. It doesn’t help that the motor boats used to ply tourists also expel a lot of their wastes into the coral habitat. Corals are also blasted apart to make way for harbors.Some numbers suggest that 40% of the coral destruction is being caused by these human activities, as opposed to only 10% caused by climate change. This is substantiated by the fact that some coral islands that are not inhabited by humans have shown much less bleaching. Can the corals cope with all this? The future doesn’t look very good. Global temperatures are expected to rise by 4 degrees by the end of the century. If the current trends continue, bleaching could become an annual event and between 2030 and 2060, all corals of the world could become extinct. However, nature cannot be underestimated. Corals have been present on Earth for millions of years and have managed to survive 5 of the previous mass extinction events. This has happened because they are extremely diverse organisms and also extremely simple organisms. Both helps them adapt and evolve fast to changing climactic conditions. Yes, the current unfavorable conditions could drastically reduce coral diversity and the associated aquatic diversity. But scientists have already identified some resilient corals. In the Middle Eastern waters, some species of corals are now surviving in waters 4 degrees above normal temperature. Some other coral species have adapted to living in deeper waters to escape the higher temperatures. Our only worry is whether this natural adaptation can keep up with the rate of current climate change. As I’ve mentioned before, the current extinction event is 1000 times faster than previous extinction events. Therefore, they way forward is not to completely rely on natural adaptation of corals, but to minimize the damage caused on corals by human activities. Another before-after picture from American Samoa. Great article. I hope our beautiful coral reefs can recover somehow. Yes, I have they can too. Although, I’m not very optimistic of the extent of recovery. They need all the help they can get from humans, through altered ocean-related practices. Good article. I knew there was trouble with the coral reefs, but I didn’t really know what the problems were. This is so sad and so frustrating. Yeah, I had no idea of the extent. Your posts are so informative… I can see I have a lot of reading to do. Thank you for the follow because it allowed me to find your blog. And I am looking forward to catching all of your posts. Excellent! Haha, yes, there are a lot of posts to catch up on, but I hope you enjoy them!